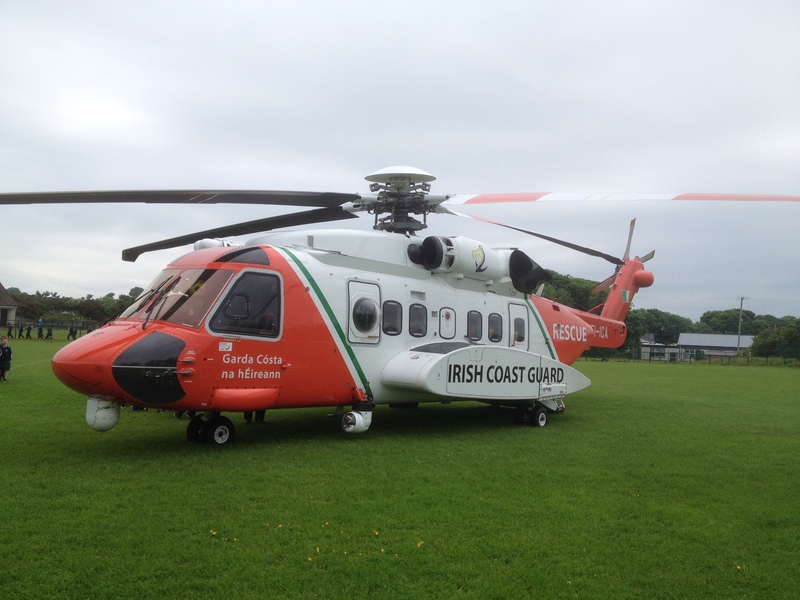 The helicopter from the Strandhill-based Coast Guard visited the school on Tuesday June 7th, 2016. All of the pupils gathered at the nearby GAA pitch and watched as the helicopter appeared on the horizon, circled around and then landed carefully in the middle of the pitch. Once the rotors had come to a standstill, all of the pupils, class by class, got the chance to file through the helicopter, entering by the winchman’s door and exiting through the rear door. They could see at first hand all of the equipment that the crew use when on rescue missions. Afterwards, the crew visited the school and got a tour of our new facilities in The Glen. They then spoke to all of the senior pupils in the hall about safety issues and how to use the emergency services responsibly. This was a special visit which the pupils really enjoyed.